Preparing this is just so easy. You can pair it with your any of you main dishes such as fried meat, fish, chicken, etc. 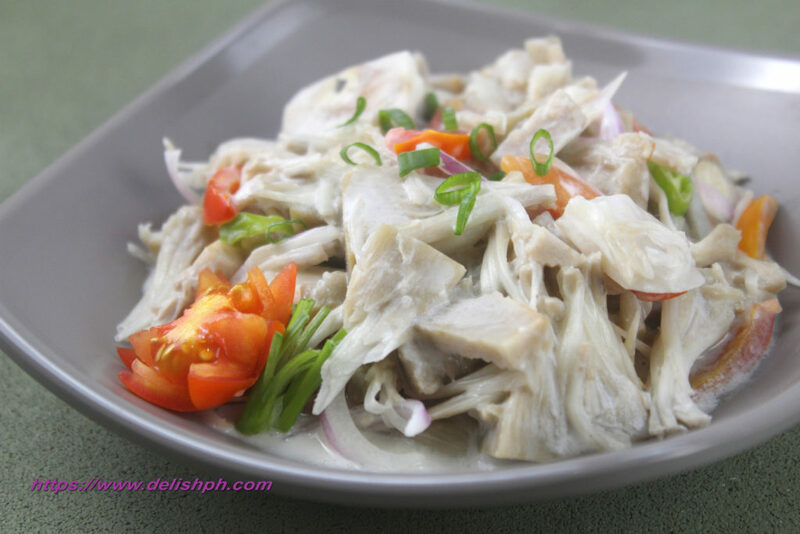 Ensaladang Langka might ruin your diet since you’d be asking more rice. 1. Boil raw jackfruit in water with salt until it softens. Drain water, let cool and shred into strips. Set aside. 2. In a pan, pour in the vinegar, brown sugar and season with salt and pepper. Boil for about a minute. 3. Pour in the coconut milk. Simmer for about 2 minutes. Remove from heat. Set aside. 4. Put the boiled langka in bowl. 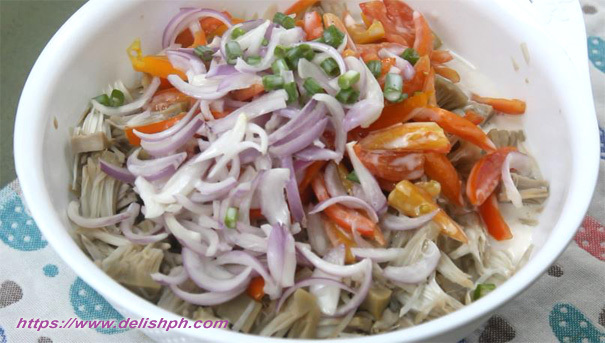 Drop in all the other ingredients, ginger, garlic, tomatoes, onions, green onions and fresh chilies. Pour in the coconut milk-vinegar mixture. Mix in until properly incorporated. Growing up, I always see my mom making this appetizer at home. And I’d say this is one of my favorites. So I decided to share this to everyone. You can adjust the flavor by adding more salt, or vinegar and sugar if you want to. This appetizer will become even tastier if you leave it overnight or 4 hours before serving. Enough to get all the flavors absorbed by the jackfruit.